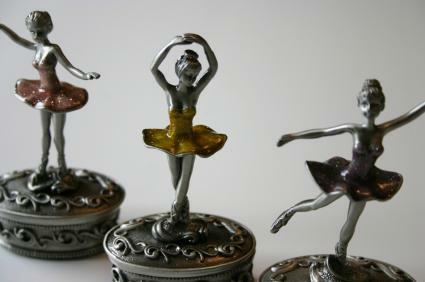 For little girls, dancers and non-dancers, ballerina music boxes are a staple of a childhood dresser. Many children covet one of the pretty pink ballerina boxes that they see at their friends' houses. If you know a little dancer or a little girl who likes pretty and pink, a musical ballet box may be a great gift. The traditional music boxes with ballerinas inside of them (that twirl when the music starts playing in one of the most basic ballet positions) are often pink or white and have ballet shoes and ballerinas painted on the outside of the box. The sound quality is nothing to write home about, but this does not detract whatsoever from their charm in the eyes of young girls. Whether the box plays a tune from Mozart or a number from Giselle, girls will adore these little music boxes. The Land of Nod offers one of these classic music boxes with a ballerina inside, and many other vendors offer variations on this theme. For those looking for a keepsake gift that can be passed on from one dancer to another, or simply a gift that is designed to stay on a girl's dresser long after she has stopped wearing tutus, some companies make wooden ballerina boxes that play music but go a step beyond the craftsmanship of the basic $20 music box. These fancy music boxes can be ordered online, from makers in Italy and other countries. This wooden ballet music box costs more than $100, but has timeless beauty and for a bit more you can have an engraved plaque placed on it for personalization. For a very special occasion, this can become the perfect gift. The first thing that comes to mind for a music box for a young dancer is one of the boxes that when you open it the plastic ballerina inside starts spinning. If you are one who likes to think outside the box, you may like some of the other types of ballerina music boxes available. For example, this hardwood music box has the ballerinas inlaid on the cover of the wooden box instead of spinning inside the box. While some children prefer the spinning ballerina, don't forget that the ballerinas on this box are visible even when the box is closed. Another benefit of this particular box is that you can choose a song to have in the box; if your little ballerina has a favorite tune, you can make this gift even more special by choosing her favorite song to put in the music box. If you like this style, but would like a smaller, less-expensive music box, try this one with a pretty pink interior. There are plenty of makers who make several different types of modern music boxes for ballerinas and little girls. Another option is to seek out an antique music box. While this can be a more difficult shopping endeavor, there are online sources that can make it a possibility. For example the Music Box Attic regularly offers antique music boxes and if you visit their site on the right day, they may have a ballerina box available for purchase. Ballet music boxes make excellent gifts that will be treasured for a long time. Another great gift idea for young ballerinas is ballet necklaces and other jewelry. You can put such a piece of jewelry in the jewelry box when you give it, or you can give a necklace next year to a dancer to whom you gave a jewelry box this year. Regardless of what she puts in it, she's sure to treasure the box itself as it evokes romantic ideas of dancing and ballet.